Beethoven’s 33 Variations on a Waltz by Anton Diabelli, Op. 120 is thought by some scholars to be one of the composer’s crowning achievements. It’s a work that takes a mediocre 32-bar waltz written by Anton Diabelli and expands it into a 55 minute work of 33 variations exploring every nuance of the theme, or at least as many as came to Beethoven’s mind. There are several conflicting theories as to the genesis of Beethoven’s opus, and playwright Moisés Kaufman has drawn from many of them to weave an intricate and captivating tale in his play, 33 Variations, now enjoying its regional premiere at TheatreWorks. Time is fluid as Kaufman intertwines present day with Beethoven’s time running two separate, yet often superimposed stories surrounding the development of the variations. He approaches the story as seen by Beethoven (Howard Swain) as he struggles to compose the work, and by Dr. Katherine Brandt (Rosina Reynolds), a musicologist writing a monograph discussing how Beethoven’s Diabelli Variations came about and analyzing their content, but this isn’t the sum total of the story. Beethoven and Brandt are mirrors of one another, each racing the clock to finish his or her master opus before time runs out. For Beethoven, his ill health and impending deafness plague him. He initially refuses to write variations for what he considers a schusterfleck (or cobbler’s patch) of a waltz. He later becomes obsessed with the work as his publisher (who is also the waltz’s composer), Anton Diabelli (Michael Gene Sullivan), keeps pestering him for the finished product. Beethoven continually puts him off saying it’s not yet ready as he diverts his attention to other works along the way such as his Mass in C Major, although in that, the historical timeline doesn’t quite align with the story. Anton Schindler (Jackson Davis), who is both Beethoven’s secretary and as history will later determine his somewhat unreliable biographer, is both a help and a hindrance at once trying to fend off outsiders while simultaneously pressuring Beethoven in his own way. Katherine too has health issues as she battles Amyotrophic Lateral Sclerosis, more commonly known as ALS or Lou Gehrig’s Disease, while she travels from New York to Bonn, Germany to continue her research against her daughter’s and her nurse’s advice. She has a somewhat tenuous relationship with her daughter Clara (Jennifer LeBlanc), who later travels to Germany to help care for her along with Katherine’s nurse, Mike Clark (Chad Deverman). From their first meeting before Katherine’s trip, Mike takes a shine to Clara, and through their close association, they fall in love. The third member of Katherine’s entourage is a librarian, Dr. Gertrude Ladenburger (Marie Shell), who over time becomes a trusted friend through the months they spend together poring over Beethoven’s sketchbooks. Director Robert Kelley expertly deploys his top flight cast in this intriguing and eye-opening production of Kaufman’s work. His staging is exquisite, aided by Andrea Bechert’s sparse, yet elegant set. Appropriately upstage center is a baby grand piano set on a platform, dexterously played by musical director William Liberatore. The variations are used as a focus, as underscoring, and sometimes as a character in and of themselves. Behind the piano, is a wall of rectangular panels, some open and some solid, which is used as a wall of screens at various times. An occasional sketchbook page written in Beethoven’s script is also flown in immediately downstage of the platform, soup stains and all. As an aside, Gertie points out that the maestro was exceedingly fond of soup, so the sketches “are not only a record of his compositional process, they are also a record of his daily diet.” Two hidden, yet functional doors are built into the upstage wall. Large, open shelves as might be found in a library are rolled in for many of the scenes, and a table and chairs finish off the set. The table is there for the most of the play, sometimes with the majority of the cast sitting or standing around it. Fumiko Bielefeldt’s costumes hit the mark being period appropriate and providing a dividing line between past and present. Even the distinction between the Americans and the Europeans is captured nicely, Gertie in the stately skirt, blouse, and lab coat appropriate for a German archive librarian. The results of Steven B. Mannshardt’s lighting design and Brendan Aanes’ sound design enhance the experience for the audience as well. A particularly nice touch is the use of “A Fifth of Beethoven” (Walter Murphy’s disco hit) as a cell phone ring tone at one point. Reynolds starts the play as the strong, authoritative expert, taking control of her destiny as she pursues her work despite her worsening illness. At first, we only see subtle hints that Katherine is even sick, initially limited to her left hand and arm. As the story and her illness progress, we see a slow acceleration of symptoms, until late in the play, her speech and movement restrictions capture the deterioration we’d expect in someone so afflicted with ALS, still allowing her cognitive and internal strength to shine through. Her performance is touching and very realistic while remaining slightly understated. A tough balance to achieve, but Reynolds does so with aplomb. Swain’s Beethoven is at first bombastic, not beholden to the social contract even of his time, but that’s consistent with many biographical works suggesting that allowances were made for his inappropriate behavior given the genius of his music. He shows several sides to his character, and he has a particularly touching scene with Reynolds late in Act 2 when the two clearly cross metaphysical boundaries. Shell’s Gertie shows nice growth, first appearing stiff, formal, and correct, all appropriate for her position. As Gertie and Katherine’s friendship develops, Shell, softens, and she becomes very approachable and likeable. LeBlanc’s Clara also develops nicely throughout the play, at first not quite estranged, but certainly not close to Katherine. She too softens as her character gains an understanding of both the importance of Katherine’s work and the gravity of her illness. While more a reflection of the writing than the acting, Deverman’s Mike takes the longest to settle into a more realistic vein. At first, he seems mostly there for comic relief to disarm the tense exchanges between Katherine and Clara, but later, he’s a comfort to them both, though he never completely loses his clownish overtones. Davis and Sullivan’s characters are written more as personifications of a merging of sometimes conflicting historical references, but together, they provide a backdrop for Beethoven’s conflict. One common theme between Beethoven and Katherine that comes through the strongest is that music gives them both light and life, without which, neither can survive. The ending, while not unexpected, is satisfying, the final variation and the many stories all colliding in perfect harmony. 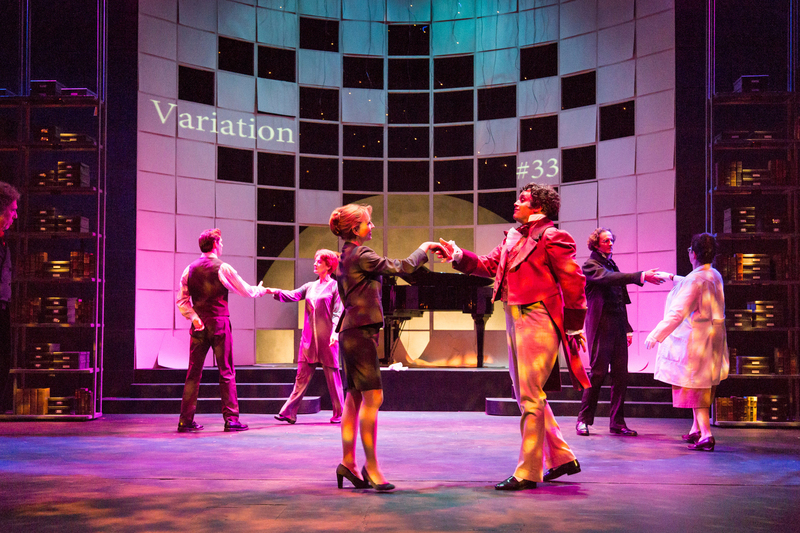 TheatreWorks’ production of 33 Variations is nothing short of brilliant and should not be missed. When: Wednesdays – Sundays through 28 October 2012. See www.theatreworks.org/shows/1213-season/33variations for more information or to order tickets. is awesome, кeep սp tҺе ǥood աork!